Yes, this is annoying to say the least, especially if you have roughly 8585 of those! This is insane! 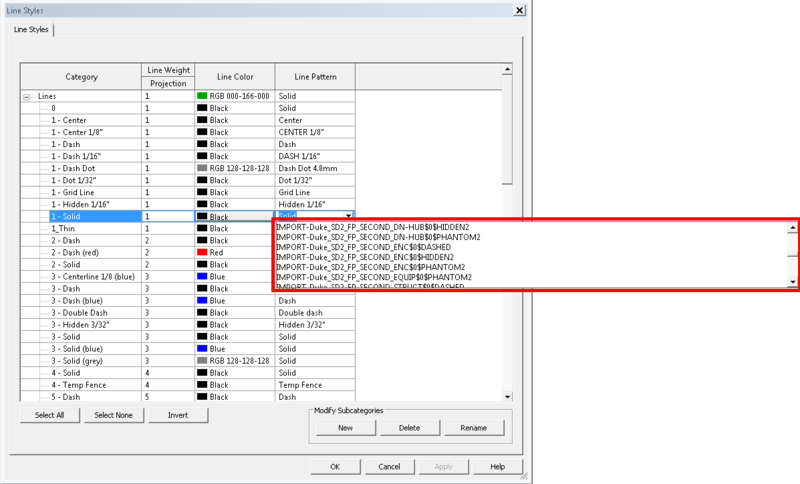 Here’s how to get rid of ones that are named in a way that my gut feeling tells me come from AutoCAD – IMPORT – Xref – …. yes I can see you from a mile away! First let’s get all Line Patterns using Element Types and All Elements of Type. Once you have all of them you can see their name with Element.Name node. Yes, this looks a lot better now. I only have 42 line patterns left in the project. Congratulations, you have just taken out AutoCAD trash! This is quite useful, especially when working with a lot of new user that like to import. 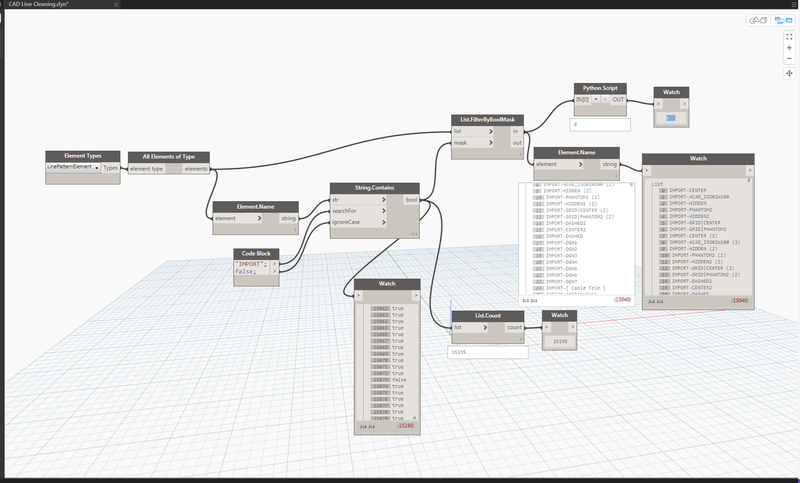 Was trying to do this myself, but I couldn’t find the nodes on Dynamo Library. Are them so customized combined nodes? I have not been very diligent about posting my nodes in Dynamo’s Package Manager. I need to get better at that as I realize that a lot of people use it. Also, sometimes I write posts and post Python code for certain things that I don’t want to post to Package Manager. Some workflows are very specific and I don’t think would make for a great node so I just keep them as Python custom components. When you see Python code posted just copy and paste it into a Python node and that will do the trick. Good luck! the “Element.Name” node is not happy with the “in” value coming from List.FilterByBoolMask” node… it produces the “Dereferenceing a non-pointer” error. How come it seem to work in your script? How do you extract the elements from the “in” of the mask node (which is a list) and feed them to the delete script? Hello Konrad. Very very cool workflow and script creation! Mightily impressed. 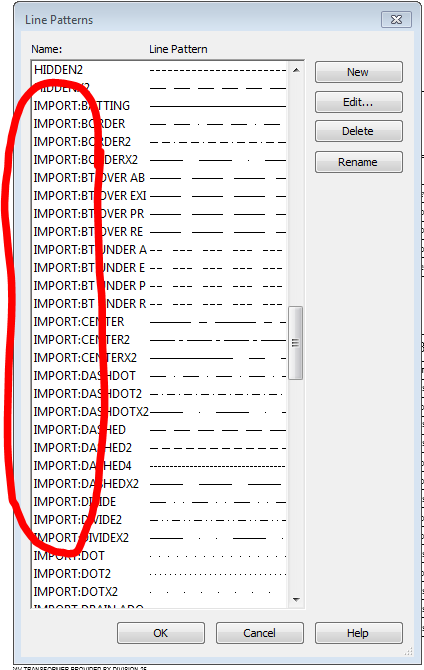 We have this issue currently in our office on a job – someone’s inadvertently imported a CAD file. I was hoping to use it to cut out a lot of manual deletion. I’m wondering if the latest Dynamo release has changed things slightly? So somewhere in the filtering process you managed to feed text into the Python node instead of elements. I would suggest that you backtrack your steps and see what output you get from the FilterByBooleanMask node and make sure they are all elements. 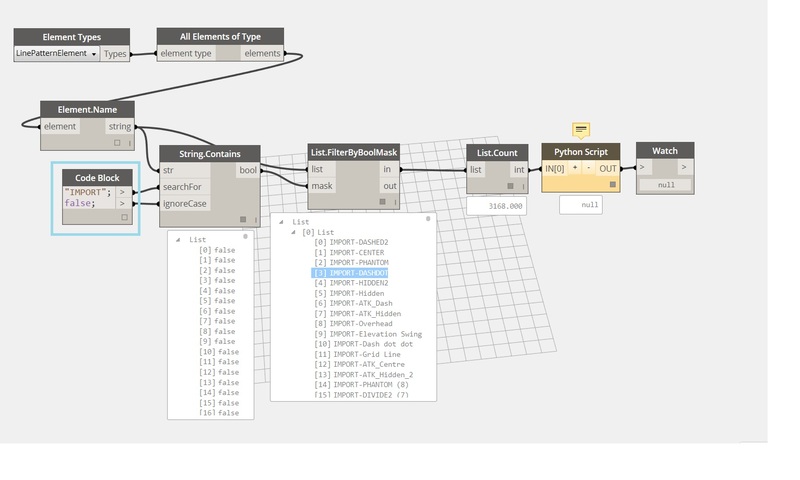 This error shouldnt be generated by latest Dynamo. Hello Konrad. That makes perfect sense. I’ve gone through my script and do believe I’ve followed your examples. I’m feeding in a string into ‘searchFor’ – but unless I’m mistaken, that is what you have above? Beyond that I’m a bit stumped. I’m wondering if somehow I didn’t copy your code over correctly? I tried it three times however. While I’m picking up Dynamo now (The snowball is gaining momentum), Python is still anathema to me (But it’s on the to-do-list!). You have a list problem. I am not sure if you noticed but the output of your get all elements of type returns a nested list or so called Nested List. When you make that an input into String.SearchFor it checks just the top most list and not the sublists. Either flatten it or use List.Map with String.SearchFor as a Function. Let me know if that worked. First of all thank you for your time, I really do appreciate it. 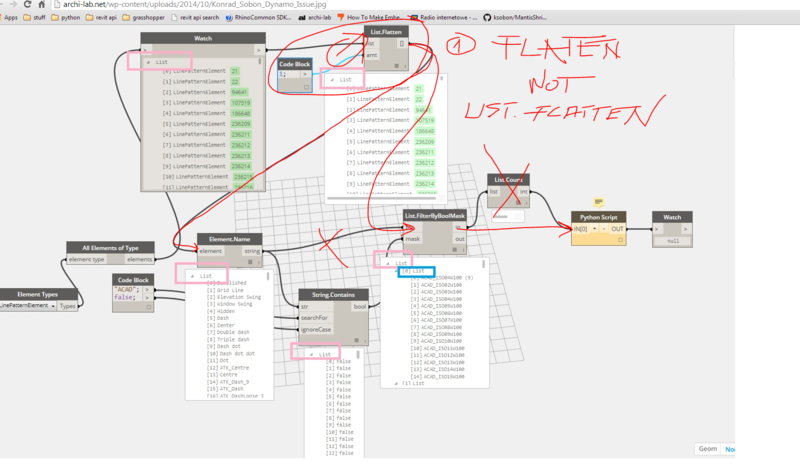 Secondly, I have attached another image showcasing the flatten method. I’ve also tried the list.map to no avail. I’m wondering if I’m inputting it wrong however. As per your previous comment, the things I’ve highlighted in Pink, are in fact nested lists? I assumed it was just a title stating that the output was in fact a list. If nested, the flatten node isn’t functioning on them. Obviously the one highlighted in blue is a sub-list. I’m wondering if this could be anything to do with Revit? I’m using 2014 right now for a job (Spanning a couple of years – consistency etc). I do have 2015 as well but don’t use it at the moment. List.Flatten is a good node when you want to flatten a list by a given amount, but in this case the best solution is just Flatten. List.FilterByBooleanMask is to filter line pattern elements, so that is what needs to be inputted into it. Give that a whirl and see what happens. Ah-ha! Success. Thanks a million Konrad – you rock. Super, działa ! Dzięki za dokładny opis . 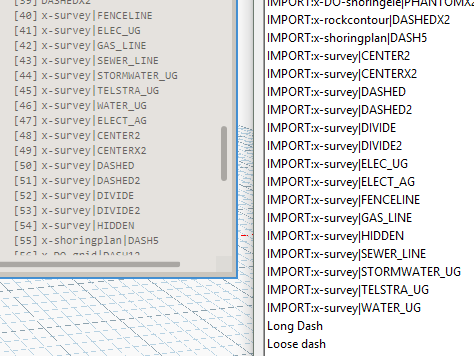 I seem to have a strange result where the line style itself ( 0.18_JX ) is delete from within the drafting view but is still “there” under the Manage Line Styles menu with settings cleared. Do you happen to know an approach to delete the line style itsef as opposed to the line pattern? Yes, this is expected as the post was about deleting LINE PATTERNS and not LINE STYLES. Those are two different objects. Luckily deleting Line Styles is not very difficult. Please see attached image. All nodes used are part of Archi-lab package. Good luck! ps. Remember that not all line styles can be deleted. There are some line styles like Wide Lines, Room Seperation, Hidden Lines, etc that are built in and cannot be deleted. Only User Created Line Styles can be deleted. I did follow your steps but still I can’t delete these line patterns. I think there is something with Python Script node I’m not understanding. I’m getting a return of 0.00 when i run this whole thing. what version of dynamo was the python code written for? nvm. upgraded from 0.7.2 to 0.8(.2?) and it worked. thanks! You showed a way to delete Line Styles. You use a node called “Get All Line Styles”. I cant seem to find this node. Do you have an updated way of doing this? We have thousands of line styles that were repeated in Revit that need to be purged. Thanks for reporting. I will check that out sometime in the future. Thanks for this post – very helpful. I’m attempting to do this with your Delete Elements node rather than the Python script and it’s not working. Any ideas? Thank you! I had over 17500~ line patterns and managed to delete them by following your tutorial. The file size went from 600mb to 300mb. I don’t even know much about dynamo. Your post was really helpful! Good to hear you were able to make it work. Cheers! In Dynamo the “IMPORT:” is removed. I can’t figure out how you select the pattern to be deleted in your code. Thank you, this is life saver. I deleted 13500 line patterns just now. I am glad I could help. This is awesome. Thank you for sharing this. This was my first dynamo program. While I am just copying what you’ve done, it still lays out a foundation for me to get started. I am having an issue though. The Python script is not returning the actual number of Line Patterns removed. I am running v1.2.1.3083 & Revit 2017, also included a ZIP of the program. The python script was also copied and pasted with no alterations. Other than that, it appears to work on an out of the box template file with a manually named line pattern. You just saved me a lot of time!! Thanks for your amazing work! I had the same problem as Sol, maybe you should upload the correction you made on his image. What does this mean and is it something I can fix/adjust to work with my LineStyle.dyn? I have attached a copy of my .dyn file. 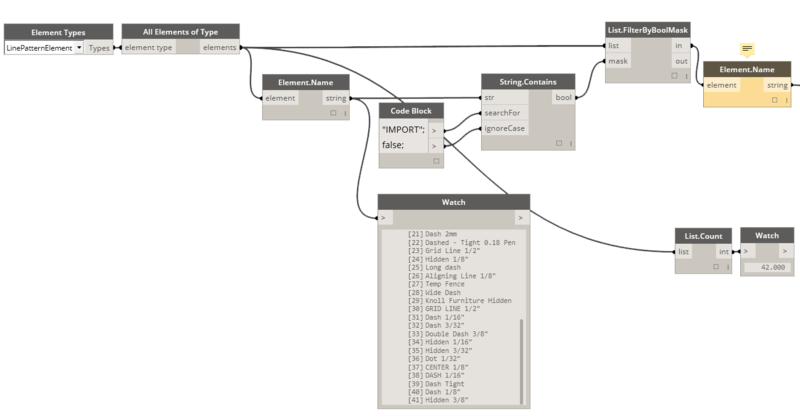 I’m sure it’s more cumbersome than it needs to be but this is the first time I have done anything in Dynamo. 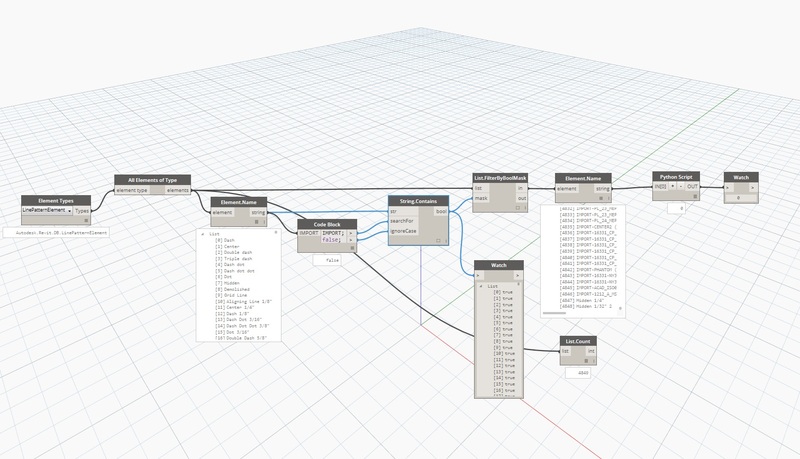 this is my first time using Dynamo. 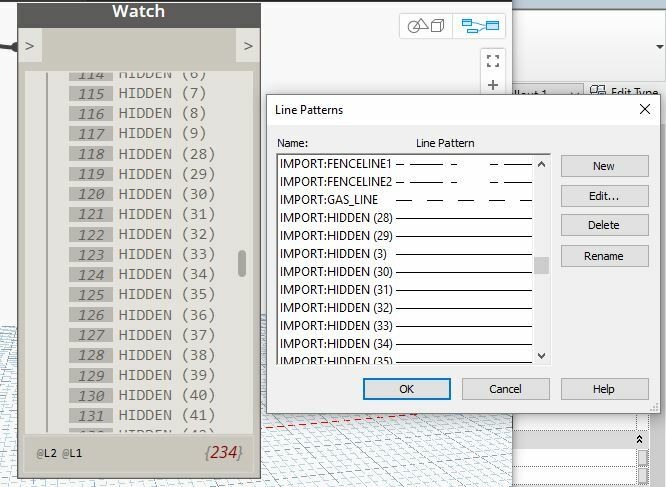 i have 15k Cad line patterns i need to get rid of and i followed you instructions and i’m not getting any errors, but its not deleting the patterns. can you please tell me what i’m doing wrong, i cant figure it out. Great for a purge but what about checking if they are in use first, then if they are swapping in lieu of just deleting? 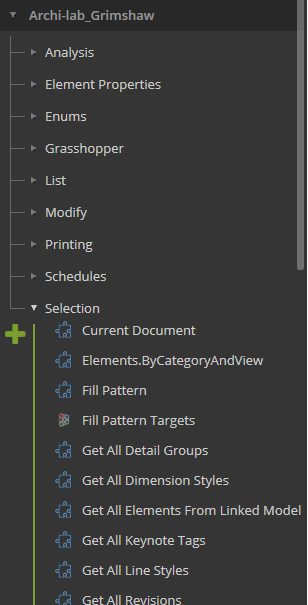 Particularly in the line styles and object styles? Then maybe the view templates? I have the same doubt of Roland, Is there a way to check or filter the element that are in use? Anyone know why I cannot get the Revit Elements to load? I cannot get the “All Elements Type” to install… any idea’s why? This looks like a bad install of Dynamo. Consider re-installing. Thank you so much. I was able to follow through and make the node. Can I get my hands on a copy of the dynamo script. Sure! Here’s a link: https://drive.google.com/file/d/0B3QQaPkepGSkM2NPZ09xVEwzTkk/view?usp=sharing Keep in mind that I disconnected the delete node, just in case you wanted to verify what will be getting delete before you actually do it. Good luck! I am using tags to add any additional information to posts. This script is, for the most part, awesome. 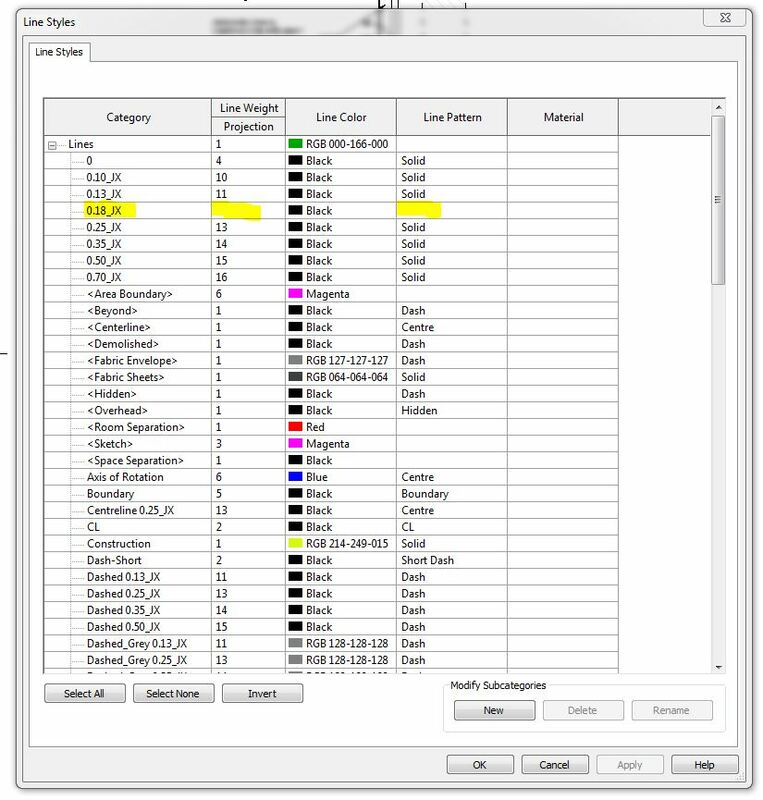 However, it appears that with later versions of Revit (2016 and beyond) it will only remove line patterns that have IMPORT in the name of the line pattern. 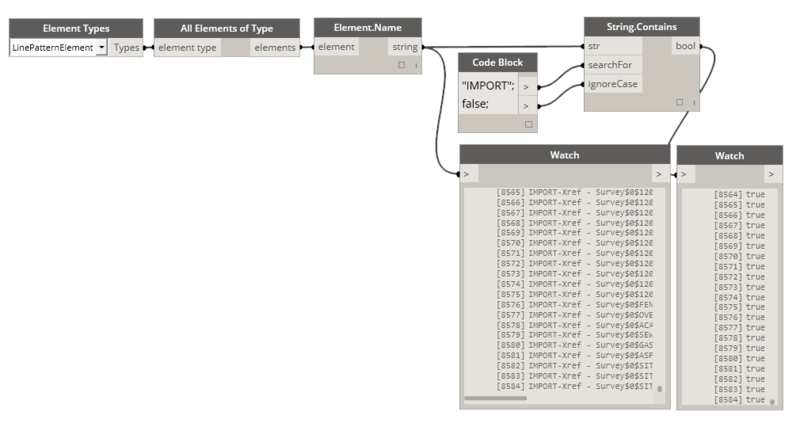 With the later versions of Revit, instead of tacking IMPORT onto the front of the line pattern name, Revit now leaves the line pattern name as-is (in some cases) and tracks whether it’s imported in some other way, seemingly by giving it a form of “tag” that says IMPORT:. Any idea how we might work around this problem? I can’t figure out what parameter of the line pattern I’d need to extract to find this “tag”. Pic of the weird line pattern types is attached. Thanks for posting this! I had trouble with Line 35 of the Python Script but, after looking at your comments to Konrad, found I was linking the string to to bool mask, not the element. Fixed it and viola! 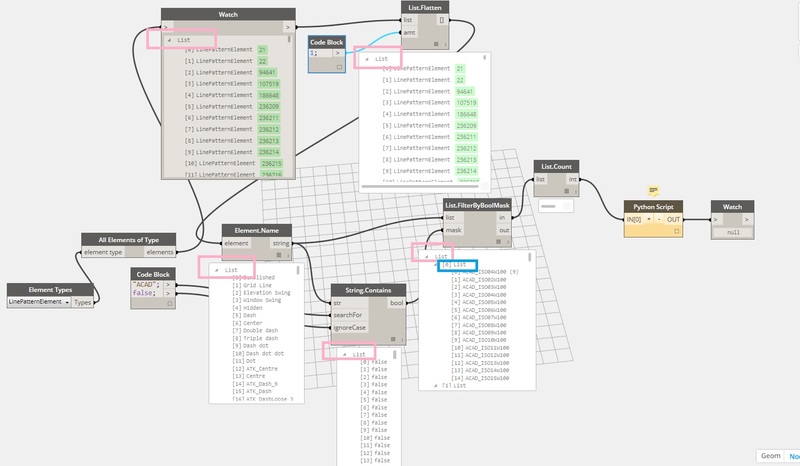 This is also working on Dynamo Player so I can make it available to my workmates. It was really useful; however, not all the IMPORT lines were deleted. Somehow Dynamo reads them as “normal” lines. See attached image. They must have slipped through the filtering mechanism. Try editing the name filter, and see if that helps.